Sat., Aug. 4, 2018, 10:27 a.m.
SAN FRANCISCO – Yosemite National Park’s iconic cliffs are shrouded in so much smoke from nearby wildfires that the air quality is worse than anywhere in America and is rivaling Beijing. 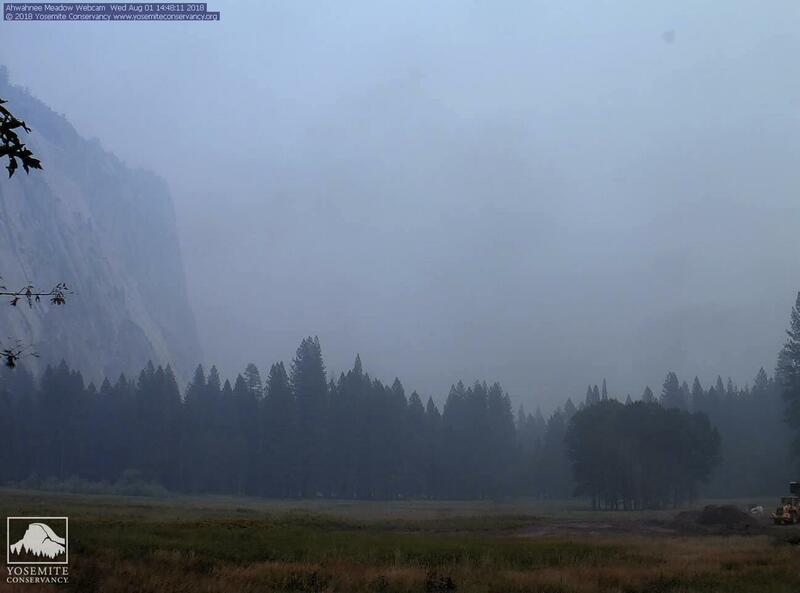 The unhealthy haze prompted officials to close the scenic Yosemite Valley and other areas on July 25 along with hundreds of campsites and hotels in what has become the park’s longest closure in more than two decades. Officials say they tentatively plan to reopen Monday after a 12-day closure but will reassess this weekend. “We are hoping to get back open on Monday but conditions have to be safe,” said park spokesman Scott Gediman, who said the decision will be based on air quality, visibility, weather patterns and safety for firefighters who are performing protective measures known as back burning near the park’s southwestern border. Coming at the height of the summer season, the closure has dealt a financial blow to Yosemite, a crown jewel of the National Park System, and caused upheaval for thousands of tourists whose summer trips have been abruptly canceled. “I’m totally gutted we can’t visit Yosemite,” said British tourist Caroline Lansell, on a summer holiday to California with her husband and two children. Like many, they booked nearly a year ahead of time to secure a coveted hotel room inside the park, where hotels and campsites fill up months in advance and are typically booked through October. They fly back to England on Sunday and don’t know if or when they’ll get back to Yosemite. The 115-square mile fire near Yosemite started on July 13 and is now 41 percent contained. It is one of several large wildfires that fire crews are battling in California, where record-breaking heat and years of drought have turned immense tracts of forests and parched grasslands into tinder boxes. Overall, six people have died in the blazes and thousands have had to evacuate their homes. In recent days, the fire reached into remote areas of Yosemite, which is about 250 miles from San Francisco. The park ordered about 200 workers who live in Yosemite’s popular Valley region to leave Friday because of inaccessible roads. Not all of the park is closed; roughly the northern third of Yosemite has remained open. But officials say it is Yosemite’s longest and most extensive closure since 1997, when floods shut the park for two months. With Yosemite’s highlights off-limits, other nearby National Parks are getting a surge of visitors. “We’ve definitely seen an influx, and visitors say they had to change plans last-minute because they can’t go to Yosemite,” said Sintia Kawasaki-Yee, a spokeswoman for Sequoia and Kings Canyon National Parks. Last weekend, Kings Canyon had to shut one of its campgrounds after a rush of visitors depleted its water supply, she said. Gediman, the park spokesman, estimates a financial loss of several million dollars for the park, its hotels and gateway communities that rely on summer tourists for business. The precise figure will be calculated after the park reopens. “It’s a huge impact,” Gediman said. On a typical summer day, anywhere from 15,000 to 20,000 visitors enter the park, which charges $20 for an individual pass, $35 for a vehicle pass and up to $300 for a commercial coach. “This time of year the campgrounds would be full and the lodging would be full,” he said. Since the closure, at least 1,000 campground and hotel bookings have been canceled each day, he said, describing the 7.5-mile-long Yosemite Valley as “empty” except for smoke. Yosemite Valley is the centerpiece of the visitor experience, offering sweeping views of its majestic landmarks such as Half Dome, Bridal Veil Fall, El Capitan and Yosemite Falls. Most of those have been obscured by a choking haze for days, although shifting winds means the pollution levels and visual clarity changes throughout the day, said Pete Lahm, air resource specialist for the U.S. Forest Service, which is running the Wildland Fire Air Quality Response Program. Yosemite officials are referring visitors to the program’s website to check pollution levels. “The whole park at this juncture has been hammered in smoke,” said Lahm. “This area definitely has the highest levels (of air pollution) in the U.S. right now,” he said, adding that other parts of Northern California and southern Oregon were also at unhealthy levels due to wildfires. The Environmental Protection Agency’s “Air Now” website on Friday recorded the Air Quality Index in Yosemite at a staggering 386, or “hazardous” – higher than China’s typically smog-choked capital which had an “unhealthy” AQI of 119 at the same time. Officials note that the AQI changes throughout the day and that the pollution from industrial dust, cars and emissions is different than wildfires burning through trees and grass but still unhealthy. In addition to shutting down the valley and 350 campsites located there, the park has declared a half-dozen other sites off-limits including the Mariposa Grove of giant sequoias, which recently reopened after a three-year renovation, Wawona Road, or Highway 41, from the South Entrance to Tunnel View, and Glacier Point Road. Hotels, restaurants and other businesses in gateway communities like Oakhurst and Mariposa want tourists to know that they are open for business. Published: Aug. 4, 2018, 10:27 a.m.